When I first moved to Abu Dhabi two years ago, I refused to drive the Lexus Q bought, why? Because I was a new driver and I knew better to practice on something cheaper and more basic. And what do you know, three days after I got a rental, I had a fender-bender in the crazy parking lot! On that note, these two news caught my attention and make me wonder why UAE doesn't have that common sense. One is on Abu Dhabi's bid to host the headquarter for IRENA (International Renewable Energy Agency), and the other being the feasibility study for Dubai to host the 2020 Olympics and the World Expo. The main reason UAE wants them is publicity - the international gigs would make fancy show-off toys. I welcome their interests in the subject matters, but maybe they should consider practice in a Toyota first before bulldozing down the roads with their Mercedez-Benz. Photo taken in AD traffic by a colleage. 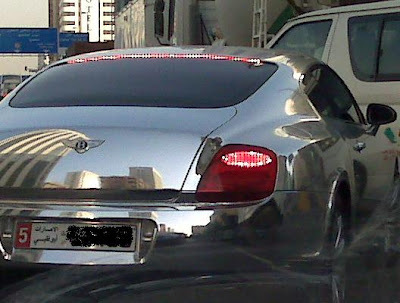 Can you tell how shiny the car was??? Hi Shu, always fun to read your blogs! maybe i'm too serious at times but come on be part of it, would you kick a dog with a broken leg?